قادر, سرمد, قاسمی ورنامخواستی, ابوذر, بنازاده ماهانی, محمدرضا, منصوری, داریوش. (1389). شبیه‌سازی عددی جریان گرانی کف روی سطح شیب‌دار با استفاده از روش فشرده مرتبه چهارم. مجله ژئوفیزیک ایران, 4(1), 58-71. سرمد قادر; ابوذر قاسمی ورنامخواستی; محمدرضا بنازاده ماهانی; داریوش منصوری. "شبیه‌سازی عددی جریان گرانی کف روی سطح شیب‌دار با استفاده از روش فشرده مرتبه چهارم". 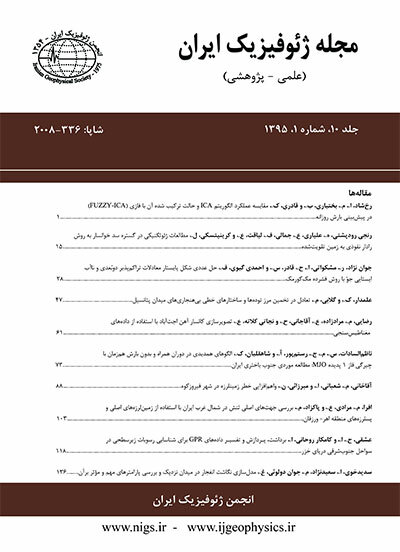 مجله ژئوفیزیک ایران, 4, 1, 1389, 58-71. قادر, سرمد, قاسمی ورنامخواستی, ابوذر, بنازاده ماهانی, محمدرضا, منصوری, داریوش. (1389). 'شبیه‌سازی عددی جریان گرانی کف روی سطح شیب‌دار با استفاده از روش فشرده مرتبه چهارم', مجله ژئوفیزیک ایران, 4(1), pp. 58-71. قادر, سرمد, قاسمی ورنامخواستی, ابوذر, بنازاده ماهانی, محمدرضا, منصوری, داریوش. شبیه‌سازی عددی جریان گرانی کف روی سطح شیب‌دار با استفاده از روش فشرده مرتبه چهارم. مجله ژئوفیزیک ایران, 1389; 4(1): 58-71. در تحقیق حاضر حل عددی معادلات حاکم بر جریان گرانی روی سطح شیب‌دار با استفاده از روش فشرده مرتبه چهارم به‌منزلة روشی با توانایی تفکیک زیاد معرفی می‌شود. گسسته‌سازی مکانی معادلات حاکم با استفاده از دو روش تفاضل متناهی فشرده مرتبه چهارم و تفاضل متناهی مرتبه دوم مرکزی و گسسته‌سازی بخش زمانی معادلات با استفاده از روش لیپ‌فراگ پیشگو-مصحح صورت می‌گیرد. شبیه‌سازی برای دو رژیم شارش متفاوت با شوری‌های متفاوت به انجام می‌‌رسد و به‌علاوه جزئیات مربوط به نحوه اعمال شرط مرزی که مناسب و همخوان با روش فشرده مرتبه چهارم هستند، آورده می‌شود. نتایج نشان می‌دهد که روش مرتبه دوم مرکزی نسبت به روش فشرده مرتبه چهارم در مقادیر شوری و تاوایی روی مرز، نوفه بیشتری ایجاد می‌کند. همچنین، مشاهده می‌شود که روش فشرده مرتبه چهارم به‌خوبی توانسته است پیچید‌گی‌های شارش را در قسمت دم جریان گرانی شبیه‌سازی کند. درنهایت نتایج گویای عملکرد مناسب‌تر روش فشرده مرتبه چهارم برای شبیه‌سازی عددی جریان گرانی کف روی سطح شیب‌دار نسبت به روش مرتبه دوم مرکزی هستند. In many numerical simulations of fluid dynamics problems, especially those possessing a wide range of length and time scales (e.g., geophysical flows), low-order numerical schemes are insufficient. Compact finite difference schemes, introduced as far back as the 1930s, have been found to be simple ways of reaching the objectives of high accuracy and low computational cost. Compared with the traditional explicit finite difference schemes of the same order, the compact schemes are more accurate with the added benefit of using smaller stencil sizes, which can be essential when treating non-periodic boundary conditions. In recent years, the number of studies devoted to the application of compact schemes to spatial differencing of geophysical fluid dynamics problems has been increasing. This work focuses on the application of a three-point fourth-order compact finite difference scheme for numerical solutions of bottom gravity current over a slope. The governing equations used to perform the numerical simulation are the vorticity-stream function-salinity formulation of the two dimensional viscous incompressible Boussinesq equations. The details of spatial and temporal discretization of the governing equations are presented. For spatial differencing of the equations, the second-order central and a three-point fourth-order compact finite difference schemes are employed. In addition, the second-order two-stage predictor-corrector leapfrog scheme is used to advance the governing equations in time. Derivation of the consistent boundary condition formulation to generate stable numerical solution without degrading the global accuracy of the computations is also presented. To derive the required numerical boundary conditions for salinity and vorticity fields at lateral, top and bottom boundaries of the computational domain, the fourth-order one-sided (forward and backward) compact relations are used. Two values for the salinity and a fixed value for bottom slope angle are used to perform the numerical simulations. Qualitative comparison of the results indicates better performance of the fourth-order compact scheme with respect to the second-order method. Furthermore, the computed value of the rate of the head growth of the gravity current generated by the fourth-order compact scheme is in agreement with existing numerical results, which indicates the accuracy of simulations in a quantitative manner. For the test cases used to perform the simulations in the present work, it was observed that the values of salinity and vorticity generated by the second-order method on bottom boundary were too noisy. While, values of salinity and vorticity generated by the fourth-order compact scheme, especially on the bottom boundary of computational domain, do not show this property and are more accurate than those generated by the second-order method. In addition, the numerical results show that the fourth-order compact scheme can successfully simulate the formation of vortices in the tail section of the gravity current, while the second-order scheme fails.